The God who created all of the universe holds it in his hand right now. It all stays together giving us light and breath because he wants it to. He created the gravity that keeps us walking upon this earth. We know why the sun is just the right distance from the earth. God made it that way so we have heat and light but we don’t become a big ball of fire. He is a God of order and reason. The sciences and mathematics were created by him – that’s how he works. There are no mysteries to him – he knows it all. And this all-powerful God wants to have a personal relationship with us. With me. With you. That’s why we were created. He wants to lavish his love on us. He desires to give us the best this life has to offer. So why do we rebel? Why do we choose to do our own thing while turning away from the best the God of All Things has for us? It must be temporary insanity. That’s the only thing that makes any sense at all. 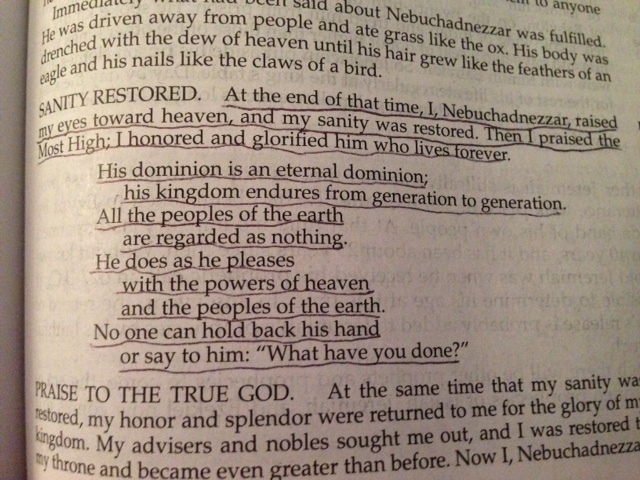 In the 4th chapter of Daniel, we read about King Nebuchadnezzar going temporarily insane. But when he lifted his eyes toward heaven, his sanity was restored. This sounds like a very wise idea. When we’re lost in confusion, doubt or despair. When we don’t like the place we’re at or the road we’re on. Let’s life our eyes to God and ask him to restore our sanity. Ask him to be our light. He promises he will always be there for us.